Harrison White, P.C., Visit ‘Your Carolina’ Morning Show - Harrison White, P.C. Attorneys Amanda Craven and Michael Gault of Harris, White, Smith & Coggins, P.C., recently paid a visit to the “Your Carolina” morning show on WSPA 7 and discussed how our law firm serves Spartanburg and the surrounding community. The segment aired Wednesday, July 23. You can check out the full clip here. Hosts Jack Roper and Megan Heidlberg thanked our firm for serving as sponsors of Caring for the Carolinas, which honors a local individual or group each month for their work in the community. The hosts also discussed our role in the Shred-a-Thon in Upstate South Carolina, a unique project that is spearheaded by Caring for the Carolinas and Shred-a-Way. In April, we hosted a Shred-a-Thon event in our firm’s parking lot. Local residents were invited to bring in sensitive personal documents such as bills, taxes and pill labels and have them shredded on our site for free. 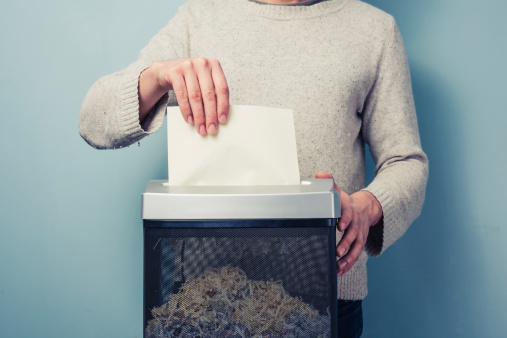 (Shredding those documents is important when it comes to protecting personal identity information.) Our firm plans to host another Shred-a-Thon event in the coming months. Amanda, who focuses her practice on Social Security disability, short-term and long-term disability and workers’ compensation cases, shared with Jack and Megan a little bit about our history and our range of practice areas. As Amanda pointed out, even though our firm has been in existence for only a little longer than a decade, many of our attorneys have been practicing law in the area for more than 30 years. She also noted how our firm has 14 attorneys who allow us to assist clients in a wide range of cases, including car accident and other personal injury cases, disability cases, domestic and divorce law, employment law and criminal defense. “We think it’s important for people to know that if they have been injured, hurt at work or charged with a crime, they have certain rights, and there are time limits involved with those particular types of cases,” said Michael, who practices both personal injury law and criminal defense. Our firm would like to thank Jack, Megan and WSPA 7 for taking the time to speak with us, and we look forward to having future opportunities to share our legal insights with the station in the future.